The upcoming NBA draft is a puzzling thing to me. When I say “upcoming,” it’s actually not happening until June 25th, but the thirst for underclassmen to jump ship and declare in hopes of being the next Lebron James is staggering. It’s clear that many of those throwing their names in the hat for the draft aren’t good at numbers. Any jump to professional sports is a risk, but from a numbers standpoint, nowhere is this moreso the case than in professional basketball. Players with the opportunity to play the sport they love seemingly walk away from the college game every year with the hopes of greatness at the next level. But unlike any other sport, those hopes are about as fleeting as a 100-yard putt. Follow me. There are 30 NBA teams, each allowed 15 players on their active roster (only 13 on the bench at a time). That means up to 450 at a time playing in “the association.” Every year the NBA welcomes new faces to the league in their annual draft, where if you don’t make it in the first 30 picks, your chances of getting a contract start to wither away. Compare this to the NFL, with its 32 teams and 55 man roster. That’s 1,760 players at any given time. Or Major League Baseball, with its 40 man roster, that’s 1,200 active players getting paid by 30 teams in the bigs. Plus in football there are a limited number of practice players allowed, and in baseball, you know the story of the league’s minor league system. In contrast, that’s not the case in the NBA. So if you’re a college basketball player, you have to ask yourself, what shot do I have? How many of the 450 active players in the NBA will retire or be let go after this season? It’s a numbers game, and if new talent isn’t better than the old talent, it’ll soon be European talent, or worse. Kentucky has perfected the “one and done,” attracting players seeking a college education (gufaw) to come play for the Big Blue Nation. Maybe I’ve just never paid attention, and maybe it’s because of the unrest in the Alabama basketball program in recent years, but I can’t remember a time when college players moved around as much as they do today. Not just jumps to the NBA, but transfers to other schools. Within the last week, Alabama lost two guards to transfer in Ricky Tarrant and Devin Mitchell. Tarrant’s next stop will be his third, a transfer to the Capstone from Tulane. This time every year at Alabama it seems it’s a waiting game to see who’s sticking around and who is leaving. Players leave in football too, but seemingly for other reasons. Though there are 10 times the number of slots on a roster, football transfers seem to be less frequent than they are in basketball. And as for jumps to the NFL, you can see why those happen. Football is a brutal game, and if you have the goods, you may not make it through another season to get paid for your craft. Just today we learned that Tide cornerback Cyrus Jones played the entire 2014 campaign with a bad hip that needed surgery. The stories of Julio Jones’ injuries that he played through are legendary…one game with a broken hand. But basketball, though it is a contact sport, is far less likely to bring serious injury. Sure, there are injuries, but you don’t see them on the scale that you see in football, which makes the gamble to try the jump to the next level that much more puzzling. Now, don’t get me wrong. I get it. All athletes want to get paid, and there are big dollars to be had in the NBA. But not everybody is making Kobe Bryant’s $23+ Million a year. You might be surprised to hear Sacramento has a point guard knocking down a cool $29,483. Or that Duke’s Seth Curry is hammering an impressive $48,028 with the Suns. In fairness, there are only 13 players in this season’s active 430 NBA players making less than six digits…six digits to play a stinking game. Bama’s JaMychal Green is bringing $134,295 with the Grizzlies, which a good many reading this article right now would trade for. But the point is, as a college basketball player, you get a narrow window in your life to play the game that you love, and there are just so many opportunities and places to do so. The college game is one of those opportunities, and with a limited number of slots available at the next level, the number of players unwilling to lock down, make the most of the chance they’ve been given at “Fill-In-The-Blank U.” then see what happens when their eligiblity is up is just mind blowing to me. And no, I’m not talking about the can’t miss draftees, like Kentucky’s Karl-Anthony Towns. But I do shake my head at UTEP sophomore Vince Hunter, or Gardner Webb forward Jerome Hill. I mean heck, if Wisconsin’s Frank Kaminsky doesn’t think he’s ready for the NBA, who in the world is in the ear of Eastern Washington’s Tyler Harvey? It was Kaminsky, afterall, who ripped Kentucky’s heart out in handing them their only loss of the season. Percentage-wise, Mr. Early NBA Entry candidate, these are the guys you’ll soon be competing against. Not Lebron. I just don’t get it. It’s a numbers game, and every year, the 430-450 available slots open in the NBA isn’t growing. With 351 college basketball programs turning out talent every year, plus international players entering the market, believing you’re good enough to be one of the 30 NBA draftees guaranteed money and a spot on a team seems more like a 90-foot buzzer-beating prayer than a slam dunk…or even a mid-percentage jumper. The fact is, if you’re not one of those 30, everybody else has the uphill battle of earning a spot, or going to play in Europe. I mean afterall, doesn’t every kid dream of playing for Italy’s Aquila Basket Trento like former Bama hoopster Tony Mitchell? 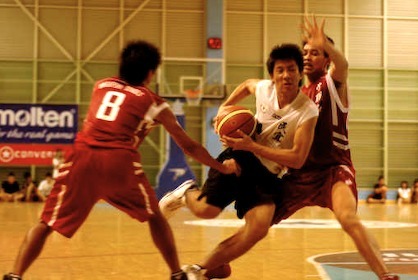 Or what about manning up for the Singapore Slingers, like former Bama player Rod Grizzard? Both left early for various reason. Both, in terms of basketball relevancy, have never been heard from again. There is a living to be made in Europe, don’t get me wrong. But earning stacks of Yen and Euros instead of Benjamins just has a discounted feel to it. If you don’t make it in the NBA, and you don’t make it in Europe, your next option is to slink down into basketball anonymity. The upside is, you’re the guy at the YMCA that everybody wants first on their pick-up team. But the downside is you have to face the daily fact that you threw away the small window of time you’d been given at a real playing career. Again, I’ve never claimed to be good with numbers. But I believe I’m far better than those who can’t seem to stay put and play out their days in college. A gamble that seldom pays what someone has told them it will. Separator image Posted in Alabama Basketball News, IntheKnow's columns and tagged with Alabama basketball, Alabama head coach Avery Johnson, Devin Mitchell, Karl-Anthony Towns, Kentucky basketball, NBA Draft, Ricky Tarrant, underclassmen declaring for the draft. so far, i’m not worried about the two transfers. both are guards. our coach is a former guard. Mitchell himself said Coach Avery’s vision of what he wants at the guard meant he would be spending significant time on the pine. he didn’t feel he fit so he moved on. when hale or norris transfers, i’ll start worrying. go sign Malik Newman, Coach. everybody will forget about transfers.